Soak up the charms of Mexico. Experience fast-paced Mexico City and uncover the ancient ruins of Teotihuacan. Admire the atmosphere of 14th-century Patzcuaro and lively Guadalajara, land of Tequila. Let Guanajuanto captivate you with its Old-World character and delve into the colonial-era in colorful San Miguel de Allende. International flights: US - Mexico City - US. 9 Breakfasts & 1 Lunch. Transfers in an air-conditioned vehicle. * Documentation of the internal flights will be available in the "My bookings" section in your "Customer Area" 7 days after you have made your booking. * Hold luggage is not included. You will be required to purchase your own hold luggage on your airline's website or directly at the check-in desk at the airport. Arrive at your US departure airport, ready for your flight to Mexico City. Arrive in the capital of Mexico, known for its Aztec temple and Spanish conquistador influence, and transfer to your hotel. Overnight stay in Mexico City. Breakfast at the hotel. In the morning, take a tour of the city. Visit the National Palace to appreciate the beautiful murals, works of the great Mexican artist Diego Rivera, the Plaza de la Constitución and the Metropolitan Cathedral, as well as the city's main avenues. Later, pass through the forest of Chapultepec and one of the most important residential areas of the city. Return to the hotel and overnight stay in Mexico City. Breakfast at the hotel. In the morning set off to the Basilica de Guadalupe to visit the Plaza de las Américas, as well as the interior of the Basilica, whilst appreciating the most venerated religious images of Mexico, patron of the American Continent. Afterwards, head to the Teotihuacan Archaeological Zone, where you can explore the different Pyramid structures in the ancient Mesoamerican city and be amazed by the sheer scale and beauty of the structures. Enjoy a Maguey tasting session, an ancestral beverage made from the pulque plant. Return to the hotel and overnight stay in Mexico City. Breakfast at the hotel. Today, set off to Morelia "the city of the Pink Cantera", founded in 1541 and a UNESCO World Heritage site. Discover the most beautiful examples of Spanish-American baroque architecture of the seventeenth and eighteenth centuries such as the Cathedral, the Government Palace, the Plaza de Armas, the Clavijero Palace, its monumental aqueduct, the Church of La Lupita and the beautiful Plaza with its fountains. Later, continue to the city of Patzcuaro, a beautiful old city, founded in the 14th century. Overnight stay in Patzcuaro. Breakfast at the hotel. Take a tour of Patzcuaro, the ancient capital of the Purépecha kingdom. Visit the Basilica of Our Lady of Health, the house of the Eleven Patios, the Gertrudis Bocanegra Library with its painted murals, the Plaza de Don Vasco de Quiroga and the traditional market. Continue towards Guadalajara, known for its tequila and mariachi music. Overnight stay in Guadalajara. Breakfast at the hotel. 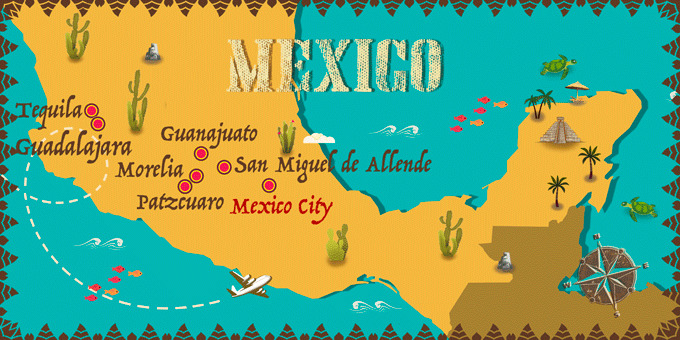 Today, head to the famous region of Tequila, that gives its name to the ancestral and well-known Mexican drink. Enjoy a complete guided tour of the magical town of Tequila and learn about the production process of the iconic drink, as well as enjoy a tasting session. Return to the city of Guadalajara for a city tour to discover the colonial architectural examples such as its 16th-century cathedral, Government Palace, the Degollado Theater, in addition to the old Hospicio Cabañas. Return to the hotel and overnight stay in Guadalajara. Breakfast at the hotel. Depart to Tlaquepaque, the largest pottery centre in the country where you can visit its many galleries that house extraordinary pieces of popular art. After lunch, continue the journey to the city of Guanajuato, the birthplace of the country's independence, located in the centre of Mexico. Overnight stay in Guanajuato. Breakfast at the hotel. Take a city tour of Guanajuato and enjoy the architecture of its historic centre, which is considered by UNESCO as "Historical Heritage of Humanity". Travel through the streets, admiring its ambience and perspectives and its squares that house the most interesting buildings such the Juarez Theater, the Basilica of Our Lady of Guadalupe, the University, the Hidalgo Market and the Plaza de Los Faroles. Afterwards, move on to the city of San Miguel de Allende, for a guided tour of its most interesting sights such as the Institute of Arts and Culture, as well as the Municipal Palace. Overnight stay in San Miguel de Allende. Breakfast at the hotel. Transfer to the city of Querétaro, the 'Cradle of Mexican Independence' to enjoy a panoramic tour through some of the facades and buildings of its beautiful historic centre such as the houses of La Corregidora, La del Conde de the Sierra Gorda and the Palacetes de la Marquesa de la Villa del Villar. Afterwards, return to Mexico City for an overnight stay. Breakfast at the hotel. At the indicated time, transfer to the airport for a flight to US. ... and we will show, in real time, all flight options available, as well as the total price of the trip for each person (including flights, accommodations and all services listed in the offer). You can sort results by price, number of layovers and time of departure. If you click on the “more” button you will see all the details of the flights: duration of flight and layovers...\"
Valid passport with one blank page. No visa is required. Departure tax from Cancun is around 1000 pesos. There are no mandatory vaccinations for travelers from the U/S. UTC - 06:00 to UTC - 08:00. Free support for tourists by calling 078. Children: 2 - 11 years.